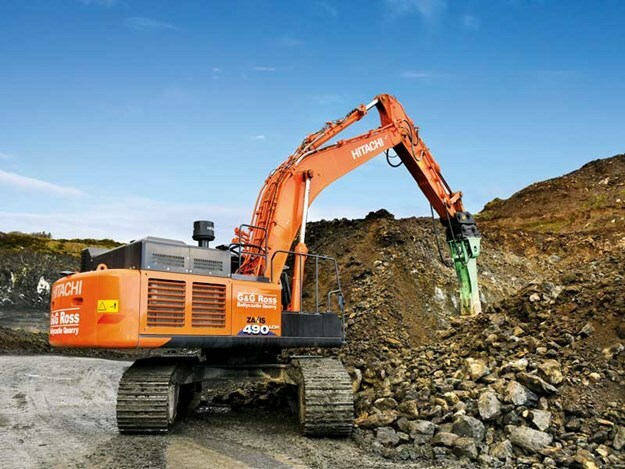 A Northern Ireland quarry business recently replaced an ageing excavator with a new Hitachi. Chris McCullough travelled to Ballycastle in County Antrim to find out why the brand emerged victorious. Running a successful quarry takes a lot of organisational skills, a dedicated team of staff, customers, and, of course, reliable equipment. Since 2002, the Ross family have owned Ballycastle Quarry in County Antrim situated between Armoy and Ballycastle and run it under the company name G&G Ross. Extending to 32 acres, the quarry is a hive of activity every day, supplying aggregate to local farmers, builders, construction companies, and many more. One of the most important tasks in the quarry for a machine is powering the rock breaker, which ensures a constant supply of material for customers. For the past six years, the quarry relied on a 2007 Hitachi 520 excavator, which was initially purchased-second hand, as its main machine on the rock breaker, but with 16,500 hours on the clock, the quarry owners decided it was time to retire it and upgrade to a new model. Quarry co-owner and operations manager Graham Ross explained the rationale behind the decision to upgrade the Hitachi. "We ran a 2007 Hitachi 520 that was actually imported from Iceland at the time of the major economic crash there," he says. "When we purchased the 520 second-hand in 2012, it had only 4000 hours on the clock. Over the years, it had accumulated 16,500 hours, so it was ready for replacing." Graham also owns G&G Ross mobile stone crushing, which runs Caterpillar and Volvo excavators so he was somewhat torn between the brands as to which one to choose for the quarry. The quarry, too, has a number of brands working within it. Graham adds, "The dilemma I had was what to replace the Hitachi 520 with. We also use CAT and Volvo machines as well so the pressure was on as to which brand to choose. "That older Hitachi never gave us any trouble at all and was very reliable indeed. It was for this reason as well as having a decent fuel economy and decent overall operational costs that encouraged us to go for a new 50-tonne Hitachi Zaxis 490LCH-6 supplied by TBF Thompson in Garvagh. 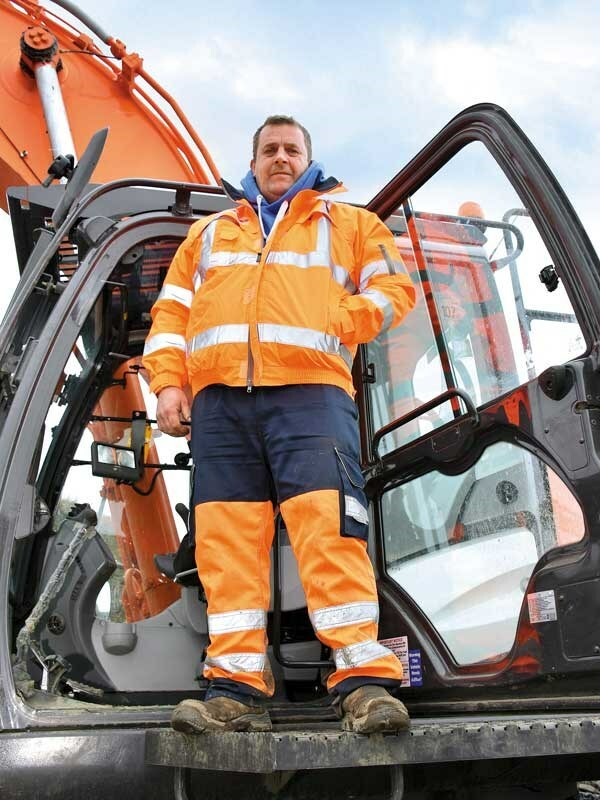 "We purchased the new Hitachi with a fixed service charge so we can keep absolute control of some of the running costs, which is a good advantage," says Graham. 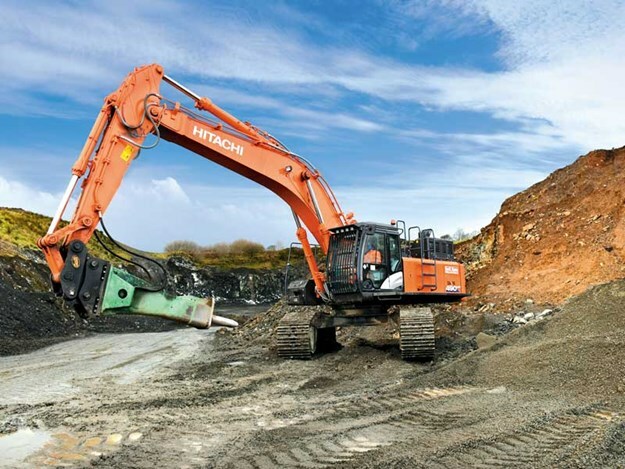 The new Hitachi 490LCH at Ballycastle Quarry is fitted with a Montabert V4500 rock breaker and is in use every single day. Hitachi says the latest ZX490LCH-6 is a tough machine suitable for heavy-duty work incorporating all the latest Zaxis-6 innovation and technologies. 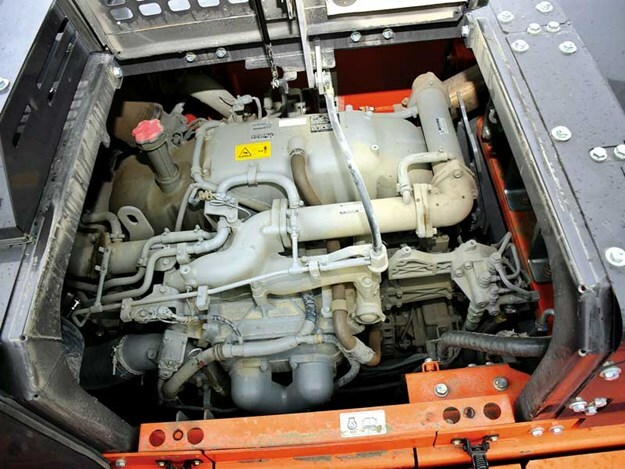 Lower fuel consumption rates, less emissions, and a quieter cab are all benefits of owning this big Hitachi, which is powered by a six-cylinder, four-cycle water-cooled, common rail direct injection Isuzu AQ-6UZ1X engine rated at 270kW. The ZX490LCH-6 also produces fewer pollutants, thanks to the variable geometry turbocharger and high volume-cooled exhaust gas recirculation system. The boom has been reinforced with thicker plates, and the undercarriage consists of robust components, including the track link, master pin, idler pedestal and bracket, and upper roller bracket. Sitting at just over 3.5 metres in height, the Hitachi ZX490LCH-6 is available with a couple of boom and arm options. It has a maximum digging reach of 12 metres and a maximum digging depth of 7.7 metres. Jaron Davis, manager at Ballycastle Quarry, says the new Hitachi is impressing everyone so far. "We got the new Hitachi just before Christmas and have put 260 hours on the clock so far," he says. "In all its time working here, the 520 only needed a drive coupling fitted. It was a superb excavator and it was the good reputation of that machine that influenced the decision to buy another Hitachi. 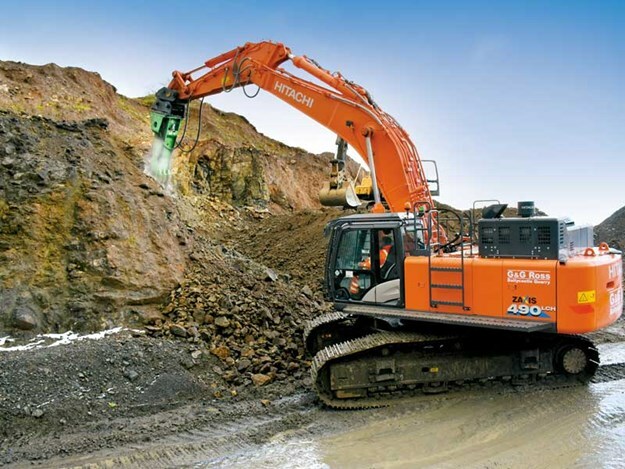 "The new Hitachi ZX490LCH-6 is performing well. It’s very powerful and very smooth to operate. 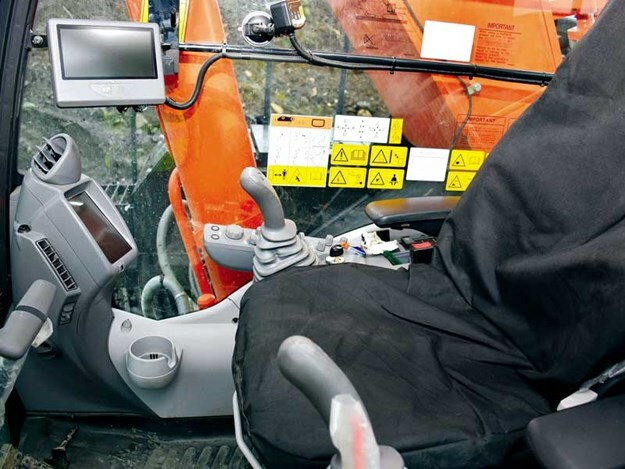 The superior cab provides a very quiet environment for the operator to work from," he said. The big Hitachi at Ballycastle Quarry works well with the Montabert V4500 rock breaker but Jaron says it could handle a larger implement. 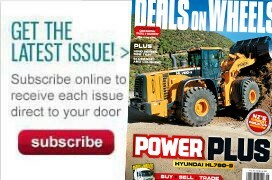 "The current rock breaker works well but with all that power the Hitachi has it could certainly handle a larger one. "Having the service charge included in the deal is an added benefit from our point of view as we can leave that all to TBF Thompson. "So far, we are well pleased with the excavator and trust that it will operate as well and give as good a service as the previous Hitachi 520 did," says Jaron.